Professional slideshows for DVD, Full-HD and PC. Rotate pictures, set transitions and zoom effects, animate using camera pans and movement paths. Integrate your own videoclips. High-definition WMV output, multicore support, text effects with Unicode, timeline with plenty of tracks. DirecX-Support for smoother performanance. The SlideShow-Master creates slide shows from theme presets in 3 clicks. Where others stop, SlideShow Studio takes off. ...... Unicode support for exotic languages and fonts. Story board and timeline bring structure in your shows. The SlideShow-Master creates slide shows from theme presets in 3 clicks. The new support for multi-core processors puts some heat on your show. The direcX support boosts the performance. Where other programmes stop, SlideShow Studio takes off and it is easy to handle, nevertheless. Sort your photos, music and sounds in the timeline in any number of tracks, or gain an overview with the story board. Create parallel sequences and collages. For example, three images may fly over the screen at once, while a camera pan runs in the background and your film title that rolls onto the screen. Use animated transparency effects for images and texts. Dub your photos via microphone. 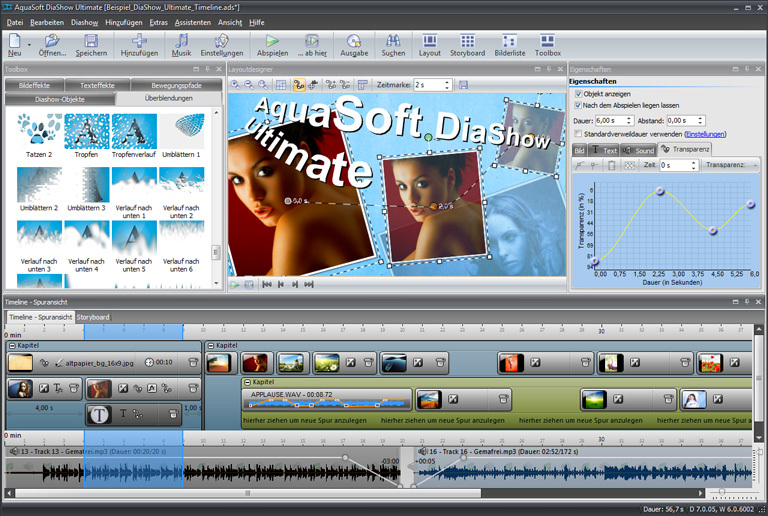 Qweas is providing links to AquaSoft SlideShow Ultimate 7.6.04 as a courtesy, and makes no representations regarding AquaSoft SlideShow Ultimate or any other applications or any information related thereto. Any questions, complaints or claims regarding this application AquaSoft SlideShow Ultimate 7.6.04 must be directed to the appropriate software vendor. You may click the publisher link of AquaSoft SlideShow Ultimate on the top of this page to get more details about the vendor.